Dragon Spirit Yoga™-The Tao of Yin & Yang: This workshop will concentrate on performing a combined series of still postures, moving meditations and breathing that places importance on the synchronization of mind, body and spirit through Taoist Internal practices & Ayurvedic Yogic techniques. Practitioners will be guided through poses from a fusion of traditions where “the Snake creeps down to meet Pose of the War Goddess… the Crane flaps its wings to find Crescent lunging Warrior stances… and the crouching Dragon climbs the Tree!” The workshop will be made accessible to a range of experience and challenges all practitioners from beginners to intermediate & advanced students. 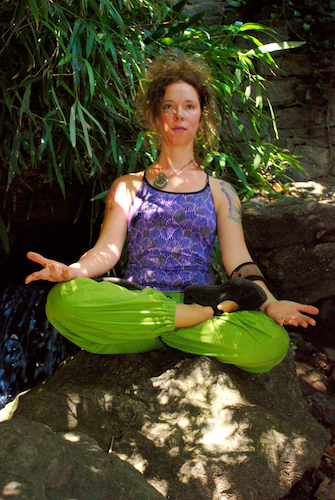 A portion of the workshop will focus on “Yin” (Lunar) meditative poses. Participants will explore the “Yin” restorative (sometimes still) postures to concentrate “Shen Chi” (spirit energy) to create more elasticity in the connective tissue (ligaments/tendons/cartiledge/etc.). The other part of the workshop emphasizes “Yang” (Solar) flowing movements. The “Yang” posture series is more vigorous, placing emphasis on cultivating and balancing “Jing Chi” (essential energy), while enhancing flexibility of muscle tissue. Practice the art of emptying the mind, and thus filling the energetic body during “Yang” focused flows. About the Instructor:Gabrielle began to formally study yoga at college in 1996, while earning her B.A. in Theater. She resonated with Yoga and other Martial/Internal Arts, finding that the practices helped her promote and maintain more clarity & focus, brought healing to old injuries, as well as offering an integrated fitness regimen to balance out her other (often stressful) courses of study. Gabrielle has been teaching for over a decade and holds Certifications in Radiant Lotus Women’s Qi-gong, Vinyasa Power Yoga, Level I and II Tao Yin Yoga (including certifications of study ranging in forms from Pa-Kua Chang, Chi-Kung, T’ai Chi Chuan and Kung-Fu). Gabrielle’s work as a healing arts practitioner and instructor continues to intersect with her work as an inter-disciplinary performance artist through the incorporation of internal and martial arts forms in combination with dance, poetry and theater presentation. For More info on her work as an Instructor visit http://www.dragonspiritarts.com. TO REGISTER CLICK THIS LINK: https://clients.mindbodyonline.com/ASP/home.asp?studioid=30107 or visit www.HonestYoga.com!